Ashton Carter (US Defence Secretary) is at New Delhi. Ashton said that progress has been made towards sealing a deal that could see American soldiers on Indian bases under specific circumstances. 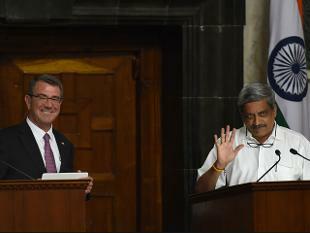 Ashton has met with Manohar Parrikar, said India and US have agreed in principle to share military logistics. Washington and New Delhi have largely agreed to the terms of a new agreement that allows the two militaries to use each other's land, air and naval bases for re-supplies, repair and rest. But US troops can be in India only on the invitation of the government of India and the agreement isn't binding on either nation. India, as the world's largest arms importer, wanted access to US technology to develop weapons at home, which is a part of the PM Modi 'Make in India' campaign. The US working with India to counter China's growth in South China Sea but has clarified that at the moment, it is not considering joint patrolling by an India-US fleet in the area. However, both sides will work closely together in the Indian Ocean, the two sides agreed.